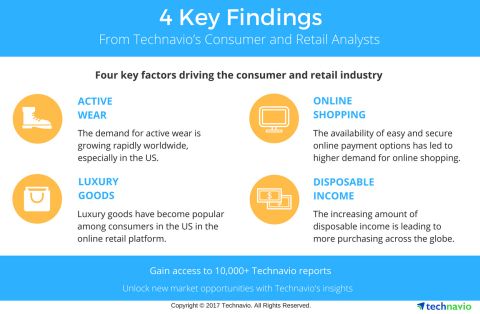 LONDON--(BUSINESS WIRE)--The global smart shoes market is expected to grow at a CAGR of close to 23% during the period 2018-2022, according to a new market research study by Technavio. The report presents a comprehensive research of the global smart shoes market by end-user that includes adults, senior citizens, users with disability, and kids. The report also determines the geographic breakdown of the market in terms of detailed analysis and impact, which includes key geographies such as APAC, the Americas, and EMEA. The global smart shoes market is dominated by a few players. Thus, these vendors need to invest in continuous product and technological innovation to sustain in the market. The introduction of innovative and technically-advanced smart fitness products attracts and motivates consumers to adopt them for their fitness activities, thereby accelerating the market growth and raising the market value in terms of revenue. Smart footwear such as step-counting shoes is very common among consumers engaged in athletic and fitness activities for monitoring their daily workouts. The increasing adoption and growing competition in the global smart shoes market have compelled vendors operating in this market to invest in continuous innovation to sustain in the market. These innovations result in the introduction of new features such as personalized coaching that suggests the required diet intake, a way of improving physical activities, monitoring the goal of physical activities, and further improvement plans based on workout plans to the users. The demand and innovation in the global smart shoes market are increasing rapidly. This is mainly because of the features that these shoes provide, particularly for athletes and fitness-conscious consumers. The key features that these smart shoes offer are step counts, calculating the number of physical activities done, suggesting proper health diet required according to the physical activity executed, and many more. The global smart shoes market is expected to grow at a CAGR of close to 23% during 2018-2022, according to a new market research study by Technavio.